Exquisitely made from strong and high quality material. Three height adjustable legs allowing the chair to grow with your baby. Loaded with toys always accessible to the baby sitting on the chair. An electronic piano with animal and number buttons. A tortoise-shaped mirror for added appeal. Vibrant buttons with pop-up functions. A seesaw with a duck and a tortoise sitting on it, make clicking sound when shaken. A worm stick that allows rotation of each of its joint. Colorful balls with beads whose patterns will change when the balls are rotated. The seat is 360 degree rotatable. Numerous toys to develop different abilities of the baby. Good bouncing chair to develop the baby’s legs. 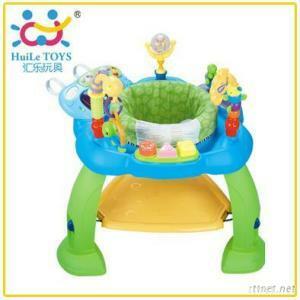 Ideal multi-functional bouncing chair for toddlers.